Kieron Pollard started his IPL season with scores of 21, 5, 7 and 17* in his first four games. Coming off the back of a poor season in 2018 where he averaged just 19.0 in 9 matches, the West Indian appeared dispensable considering the kind of resources Mumbai Indians had in their wings. Pollard, though, has changed his season around and how! In the last two matches, we have seen Pollard at his very best. From a game-changing 46* against Sunrisers Hyderabad to help win a low-scoring game to an outrageous 83 on Wednesday night against Kings XI Punjab, Pollard has established his place in the Mumbai Indians middle-order. Asked to lead the side in Rohit Sharma's absence, Pollard chose to step up and lead from the front to seal the run-chase himself. He came in at No. 4 with the Mumbai innings ambling along at leisurely pace. At 56/2 in almost 8 overs, Mumbai needed to get going and soon and Pollard made it happen with some sensational hitting. Knowing that the asking rate was creeping up, Pollard wasted little time to go on the attack. He hit Ashwin down the ground for a six and soon launched into Sam Curran whom he hit for two towering sixes and a four in the 12th over. Even as wickets kept tumbling at the other end, Pollard reached his half-century off 22 balls with his seventh six in the innings. As many as 42 of his 55 runs had come in sixes and the West Indian appeared determined to take Mumbai across the line. In the penultimate over, he went after Curran yet again and hit him for two more sixes and a four in a 17-run over. Though he was dismissed in the final over for 83 in 31 balls, he had done his bit to bring the equation down to a run-a-ball. A six and a four off the first two balls of the final over nearly took Mumbai home and Alzarri Joseph finished it for them. Pollard's 83 included 10 sixes and three fours with 72 of his 83 runs coming in boundaries. This is the second maximum number of runs in boundaries in this season after Johnny Bairstow slammed 90 of his 114 runs in boundaries against RCB. 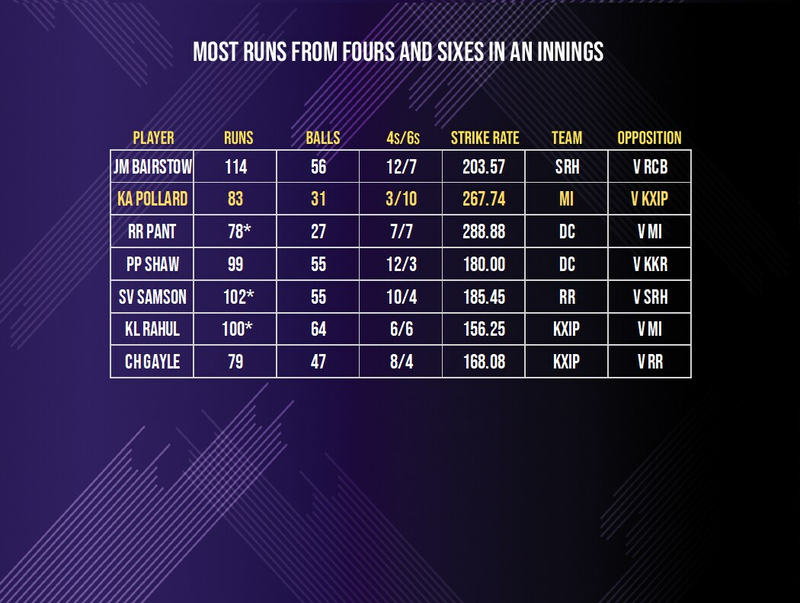 Pollard's strike rate of 267.74 is the fourth best strike rate in an innings in the season (minimum 40 runs). 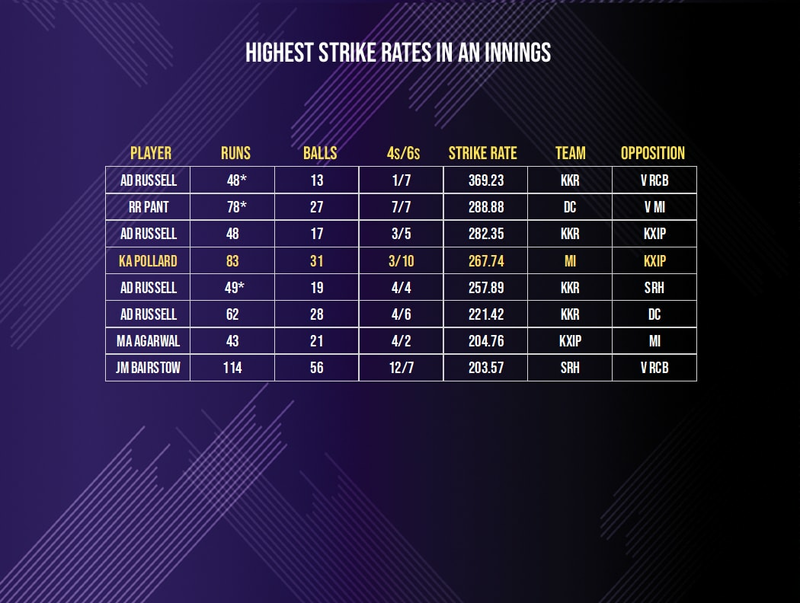 His overall strike rate in the season has gone up to 194.56 which is the second best for any batsman this year in the IPL after his countryman, Andre Russell, who has 212.39. Pollard has hit 17 sixes this season which is the third best after Russell and Chris Gayle who have 25 and 18 apiece. On his IPL captaincy debut for Mumbai Indians, Pollard put on a terrific batting display to take his side home in an incredible run-chase. He donned responsibility by walking in at No. 4 and ensured he had done the bulk of the work before walking back.